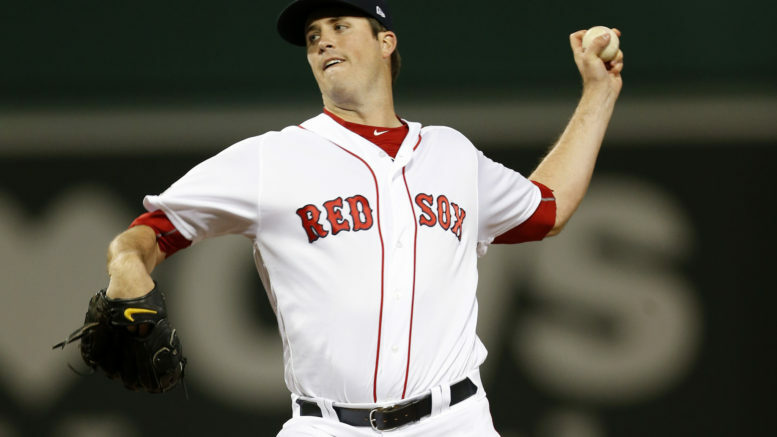 With David Price in the bullpen, Drew Pomeranz has a chance to shine in the playoffs in 2017. I’ve been right before. I’ve been wrong before. I’ve been both very right and very wrong. What I’m saying is, you can’t predict these things. But then again, you already knew that. Still, because I am impatient like just the vast majority of sports fans, I thought it would be fun to try and forecast the 2017 MLB playoffs even though they are still two weeks away. Alas, on behalf of DraftAmerica I am on a three-year roll picking the Super Bowl and World Series (with forgiveness asked for missing the 2014 Fall Classic) and I was flawless with this year’s NBA and NHL finals. But enough about me — what do you think of me? Okay, seriously, let’s stop wasting your time and get to some prognosticating. Poor Minnesota. Every time the Twinkies get to the playoffs, they have to face the Yankees, and they always lose. And badly. The Twins are 2-10 in losing four ALDS matchups against the Bombers, and this doesn’t look any more promising. Who starts for Minnesota, and will it matter? Can Ervin Santana or young Jose Berrios tame the lethal New York lineup? Luis Severino or possibly Sonny Gray has the edge, and even if they falter, the Yankees’ bullpen is so deep and talented it won’t matter. Minnesota brings some thunder of its own, but after the Yanks were shutout by Houston in this spot two years ago, they won’t let this opportunity slip. After all, they own the Majors’ second-best run-differential for a reason. Prediction: Yankees 9, Twins 4. That’s right, I’m throwing a wild card in here of my own. Instead of the obvious-looking Rockies-D-Backs matchup, I’m calling a Milwaukee upset just to be different (and because I haven’t been at all impressed with Colorado since the All-Star break). Milwaukee is minus its best starter in Jimmy Nelson, and that spells trouble. Arizona is in the unfortunate position of being in the NL West. So despite having the league’s third-best record, it has to play in this do-or-die game. Still, with Zack Greinke, Patrick Corbin, or Robbie Ray available to start this game, the Snakes are in good shape. Just hold your breath when Fernando Rodney comes in to close things out. These teams played a thrilling five-game NLDS in 2011 (both teams’ last postseason appearance) and it ended in extra innings. I’m saying lightning will strike twice. Prediction: D-Backs 6, Brewers 5 (10). The Indians will still finish with the AL’s best record despite the law of averages waiting around the corner for them. This is hard to believe: this matchup will represent the league’s top run-differentials facing off. Cleveland needs to avoid falling behind in any games, but lest we forget it’s the Indians, not the Yanks, who have baseball’s best bullpen ERA. I usually pick against sentiment (assuming that is the best way to constitute logic), but for once I’m staying with the heart here and giving the nod to the “underdog” (though, realistically, the Tribe will be favored in this series). Prediction: Indians in 4. It looked so obvious for so long it would be Astros-Yankees, not Astros-Sox. But the Indians’ surge changed things, and it gives Justin Verlander another crack at the team that denied him a shot at the 2013 World Series. The Astros’ bullpen is a major headache, and the Red Sox’s pen is stellar. That could be the difference, even in a series where Houston has the homefield edge. Ken Giles is too untrustworthy, and Houston’s youthful exuberance may fizzle against a team that wants to get the taste of last year’s sweep by Cleveland out of its mouths. Prediction: Red Sox in 5. The Dodgers aren’t coasting to the Fall Classic anymore. 4-19 after a 92-36 start, there is big reason for concern in LA, especially considering the way Arizona has owned them of late. Clayton Kershaw doesn’t have a good postseason track record, and Yu Darvish’s is worse. Arizona looks primed to pull an upset here against a perennial October underachiever. It looks so easy, the “upset” that hardly feels like one. The Dodgers are playing badly, Arizona is playing great. All the signs point to the D-Backs. Which is why, of course, I’m going true blue here. Prediction: Dodgers in 4. The Cubs are the defending champs. The Nats are perennial chumps. Chicago has the edge in bullpen and experience, even if you favor the Nats in rotation and lineup. Bryce Harper’s health is a major question mark, and the Cubs are relishing being somewhat of an unknown this time around. Everything points to Chicago coasting past the Nats and providing DC sports fans with even more heartbreak, even when it feels like things can’t get worse for them. So, again, naturally, I’m going the other way here. Prediction: Nats in 5. Here we go again. Don’t count on a sweep in 2017 for Cleveland, who needed only three games to win the 2016 ALDS vs. Boston. Chris Sale struggles against the Tribe, but Carlos Carrasco struggles against the BoSox. Both teams are better and healthier than they were when they faced off last year. Andrew Miller’s availability will no longer catch the Sox by surprise, and Boston may have its own Miller in David Price. This is a wonderfully-matched series, epitomized by Boston’s August 2 seesaw, 12-10 win over the Tribe in which the Indians rallied to take the lead in the ninth only to lose after a dropped third strike allowed the Red Sox an extra at-bat. The 2-3-2 format works against the Tribe here, because Boston can position itself to take a 3-2 lead heading back to Progressive Field, where I’m calling the Sox to officially extract their revenge for 2016. Prediction: Red Sox in 7. The team that can’t get to the World Series against the team that’s never been. At this point, the Nats will be feeling better about themselves because they’ve never even won a playoff series, let alone a pennant. But the Dodgers will be feeling relieved, too, after pushing past the D-Backs and being able to avoid all the teams that have stood in their way in recent years (namely the Cardinals and Cubs). LA got the best of Washington last year, and figures to do the same in 2017. Prediction: Dodgers in 6. Boston vs. LA. What could excite TV and all of Hollywood more? The Dodgers would get homefield here, but the Red Sox are golden in this spot. They’re 3-0 in the World Series in the 21st Century. Kershaw vs. Sale would be epic. Kershaw has actually never faced the Red Sox, but Boston has a lefty-heavy rotation capable of neutralizing LA’s lefty-heavy lineup. Conventional wisdom has the Sox giving Boston its 11th sports parade of the 21st Century, especially since they have a deeper bullpen. So, naturally… you know where I’m going with this. Prediction: Dodgers in 6. Be the first to comment on "Very Early MLB Postseason Predictions"